pediped® footwear was founded in 2004 by Angela and Brian Edgeworth in their quest for the perfect soft-soled shoe for their first daughter. Exceptional quality, unsurpassed comfort and distinctive styling have made the award winning company the fastest-growing children’s footwear brand in the United States. pediped® footwear has been awarded the American Podiatric Medical Association Seal of Acceptance for the promotion of healthy foot development, and preeminent orthopedic medical professionals, Dr. Mininder S. Kocher and Dr. Thomas W. Vorderer, deem pediped shoes an excellent choice for parents/caregivers who want their children’s feet to develop naturally and healthily. In 2011 Earnshaw’s, the premier media resource serving the children’s market recognized pediped® with Earnshaw’s Earnie Awards for Company of the Year and Best Footwear. 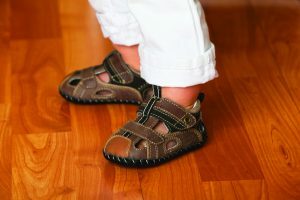 pediped® footwear is sold in over 3000 stores in the United States and 40 countries worldwide with an offering of more than 120 designs for boys and girls between their three lines, Originals®, Grip ‘n’ Go™ and Flex®. 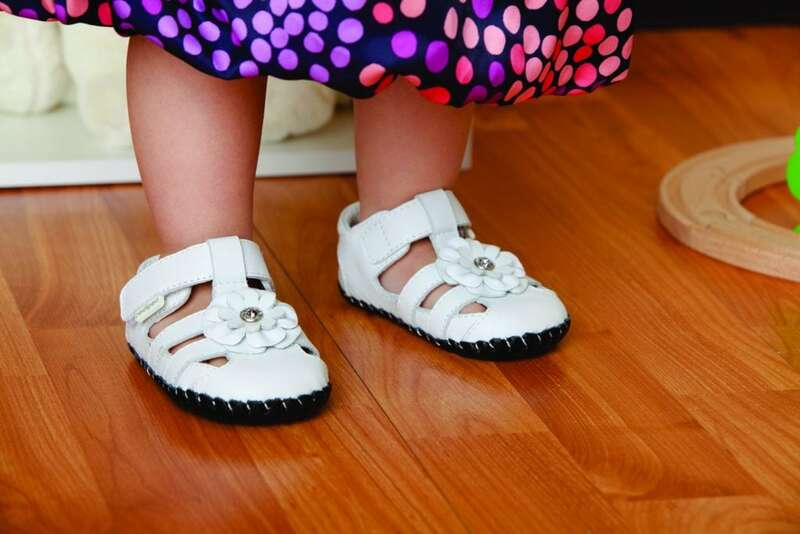 Originals® (soft-soled shoes for newborns to age 2), Grip ‘n’ Go™ (thin rubber-soled shoes for children ages 9 months to 3 years) and Flex® (rubber-soled shoes for children 1 to 8 years) are available in EU sizes ranging from 17 to 33. I love this company and their philanthropic involvement focused on helping children. In 2010, pediped established the pediped Foundation to support children around the globe. The foundation has donated over $1,000,000 in products and monetary support since the launch of the foundation. They not only care about your child’s feet, they care about children around the world! For more information, visit www.pediped.com. You can also sign up to become a pediped Insider on their website to be the first to know about special promotions, new product introductions and more. Also be sure follow pediped on Facebook at facebook.com/pedipedfootwear. A huge thank you goes out to pediped for being a part of our Virtual Baby Shower and sending us a pair of shoes for my little girl! I was not compensated for this giveaway other than a product sample. All opinions are 100% mine. Shae had been wearing Pedipeds since she was a baby and still does at the age of 4 and we love them. Actually I think Melinda just ordered Shae a new pair of sandals for the summer. Thanks for sharing! I LOVE LOVE pedipeds! I got them for my sister with her son last year. They are great for growing feet. These are so cute! Love pedipeds!! Love this brand! The soles are awesome, and the styles are so cute! I need to get a pair for my daughter, they look really comfy! These are so cute! My youngest grandson JUST started walking and these would be perfect for him! These look really cute!!! I’m going to have to look into getting a pair for my daughter! I absolutely LOVE the Pediped shoes. My son has wore some cute sandals of theirs as well as some other cute shoes. These are very cute…I know that’s not a very original comment here but I just don’t know how else to say it. If them made a line for ages up to 480 months I’d get some for myself.